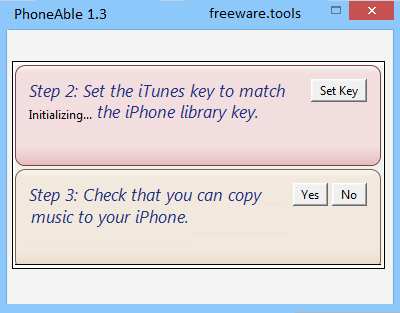 PhoneAble is a lightweight software application designed specifically for helping you process your iPhone library key and apply it to any number of iTunes installations. This way, you are given the freedom to manage your audio files on all computers and not only on the PC that’s associated with your iTunes library. Normally an iPhone is associated with just one iTunes library, and you can only manage your music with that one copy of iTunes. PhoneAble takes your iPhone library key and applies it to any number of other iTunes installations, allowing you to manage your music on whatever computer you happen to be at. iPhone automatically synchronizes music with the first iTunes library detected on the target computer, without being able to manage audio files on another PC. PhoneAble allows you to manage your music on other computers. You can take advantage of the tool’s portability status and store it on USB flash drives so you can have it with you all the time. Gaining access to its user interface requires only opening the executable file (there’s no setup included in the process). The tool does not store entries in your Windows registry so you can uninstall it via a simple deletion task. PhoneAble sports a clean and intuitive layout that reduces the entire configuration process to only three steps. Each step comes with a short description so you can easily get an idea about how to tweak the dedicated parameters. The program offers you the possibility to look for your iPhone key. The key needs to be previously backed up in your iTunes folder, otherwise the tool cannot detect it. What’s more, you can set the iTunes key to match the iPhone library key. Last but not least, you only need to check if you can copy a song from your library to your iPhone. All in all, PhoneAble delivers a simplistic and efficient software solution for helping you manage your iTunes libraries. The intuitive feature pack makes it suitable for less experience users and professionals alike.